PCBs play the most important role in today’s electronics industry. Starting from cheap toys and smartphones to sophisticated computers and radar detector systems, printed circuit boards (PCB) are everywhere. Almost every electronic device has one of these self-contained modules of complex interconnected electronic components, which include resistors, capacitors, transistors, diodes, and fuses. The electronics industry is moving toward more miniaturization, requiring design engineers to produce faster, smaller — and more complex — circuit board technology, which has a higher quality and less cost. It is important for a PCB to perform its function and support the larger electronic device. Hence, PCB manufacturers must have a system in place that monitors and tests each component to ensure that it meets various standards and delivers maximum performance. When a component fails, analysts must utilize various processes, tools and techniques to determine why the device failed and how to prevent future failures. Some machines have automated features that perform checks at various points, and operators perform visual inspections before, during or immediately after the completion of a task. However, many PCBs will fail the final test. When this happens, it is important to perform an effective electronics failure analysis in order to obtain clear and precise details about the source of the problem and to ensure that it does not happen in future. The technician must conduct a root cause analysis to identify the cause of the failure and take corrective action to fix the issue. Any electronic hardware manufacturing company strives to achieve zero-defect production. To realize this objective, manufacturers must have the capability to perform some level of printed circuit board failure analysis. Some companies rely on outside expertise for more complex problems. For many high reliability systems, such as oil rigs, space satellites, implantable medical devices and other systems, failures can be devastating. In the case of consumer products, a single failure mode, which can replicate thousands or millions of times, can have a huge impact on the bottom line. An effective and efficient root cause analysis ensures that manufacturers can initiate the necessary corrective action to prevent reoccurrence of the problem. Failure analysis processes evaluate the reliability of a component product under operation and determine how to improve the product. There are a number of tests suitable for identifying defects. The traditional techniques used for printed circuit board failure analysis focus on the “slice and dice” method. This technique employs a combination of external techniques, such as electrical testing, visual inspection, X-ray and cross-sectioning to the relevant area. The failure analyst removes a two-dimensional slice out of a sample, which uncovers features within the board. Considered a destructive testing method, micro-sectioning analysis provides the technician with a precise technique that isolates the relevant electronic component and removes the part from the PCB sample. The technician puts the component into an epoxy resin or other potting medium and leaves it to cure and solidify. After the component cures, the technician uses an abrasion technique to recede and expose the component, and polishes the part until it is reflective and ready for testing. Micro-sectioning requires the analyst to compare the sample against another functioning component. One advantage of this testing method is the ability to position the sample on a flat surface and invest each of its parts together. Electron and optical microscopy equipment can examine plate thickness, intermittent metallic layer thickness or failures to solder joints. The analyst must highlight the damage and identify the cause of the destruction. PC-MS-810 and ASTM E3 quality standards govern micro-sectioning tests. Solderability describes the ease with which a metal or metal alloy material surface can be wetted by molten solder under minimum realistic conditions. 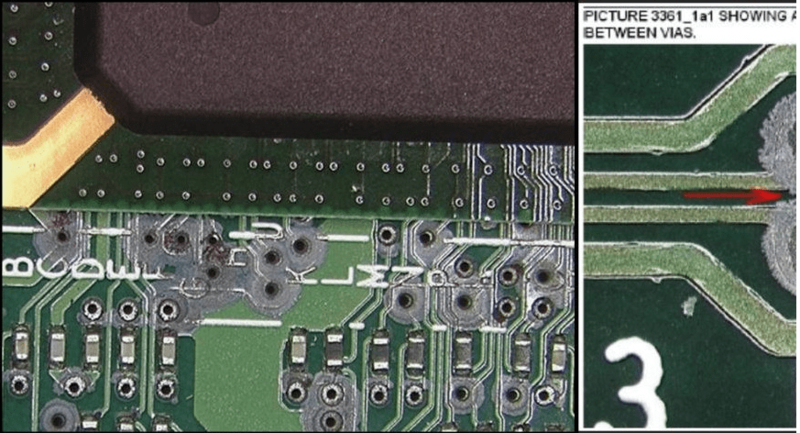 Often, the PCB manufacturing process can be the source of assembly problems, especially issues related to oxidation and misapplications of the solder mask. To minimize the probability of failure, many manufacturers test component and PCB pad solderability to ensure the robustness of the surface and increase the probability of forming a reliable solder joint. The solderability failure method evaluates the strength and quality of wetting of a solder by reproducing the contact between the solder and the material. The wetting balance process measures the wetting force and the time from contact to wetting force generation. Solderability testing can verify that the components will meet specifications and quality standards. The failure analyst must have the experience to differentiate the various surface conditions and understand the acceptable requirements of the testing technique. The analyst must also have the necessary expertise to accurately apply the specific conditions. The IPC-J-STD-002 and 003 standards govern all solderability tests. Contamination can cause a variety of issues, including corrosion, degradation, metallization and rapid deterioration of wire bond interconnects. Although PCB processing and assembly take place in an extremely clean environment designed to keep the air and components free of contamination, infection does occur and represents one the most common causes of part failure. Human byproducts, handling, flux residues and reaction products are often sources of contamination. The use of chemicals typically requires a cleaning process. The electronic industry introduced ionic contamination testing, which measures the cleaning efficiency and stability of the cleaning process. Contamination testing measures the amount of ionic contamination contained in a sample. The process of testing for contamination involves the immersion of the PCB sample into a solution. The solution dissolves the ionic contamination, which causes a change in the constitution of the solution and has a significant influence on the values or readings. The technician measures the change in the resistance of the solution solvent. Then, the analyst plots the contamination level on a contamination-testing curve and compares the value with industry standards. When a reading exceeds an established level, it confirms that the manufacturer has a problem with the cleaning process. This can cause detrimental effects, including corrosion and electrochemical migration, when parts remain in the component. This dissolving technique can detect even the smallest parts. One of the advantages of contamination analysis is its precision and accuracy. Contamination analysis must meet the standards of IPC-TM-650, method 2-3-25 for iconic cleanliness. Optical microscopy may be one of the most popular and preferred testing methods used for detecting faults, defects and problems associated with soldering and assembly. Many customers choose optical microscopy because of its speed and accuracy. The process uses a high power microscope with visible light. The microscope, which can reach up to 1000X, has a small depth field and shows features in a single plane. Board integrity represents a major concern and frequent cause of failure in electronics. Microscopy testing can verify improper construction, which can lead to stresses that can expose flaws at certain cross-sections. Scanning electron microscopes or SEMs offer a highly-effective testing technique for performing semiconductor die failure analysis. Even if a defect on an integrated circuit measures only a few nanometers wide, SEM provides the failure analyst detailed images at higher magnifications, up to 120,000X. It is typical to have magnifications of 50,000 to 100,000X, and feature resolutions down to 25 angstroms. The analyst produces a recording and record of the findings based on the images. With SEM technology, the depth of the field provides failure analysts a three-dimensional view of the sample. SEM examinations can verify semiconductor die metallization, integrity and quality. SEM also provides evidence of heat treatment and identifies the metal or alloy used. Many analysts pair SEM with micro-sectioning testing. Many X-rays provide users a powerful tool for non-invasive failure analysis. With a choice of basic film X-ray, real-time X-ray and 3-dimensional X-ray systems, users can employ the tools to detect actual or potential defects. They can also inspect a component that has hidden joints or parts located underneath a chip. The analyst uses an X-ray inspection instead of visible light equipment to evaluate the PCB. The advantage of this testing method is the ability to detect surface and internal flaws in a non-destructive manner while keeping samples in pre-testing condition. Due to the rapid innovation, shrinking components and sophisticated circuit geometries, the fabrication of a printed circuit board includes many steps and moving parts. Consequently it provides numerous opportunities to introduce a defect unintentionally. HSCBs, which have grown more complex and use a variety of integrated components, continue to grow in popularity. However, the components require boards that are composed of two or three materials which increase the possibility of failure in extreme high-speed applications. Failures also occur from pins and chip placed in an incorrect manner on the board. The lead-free assembly process requires a higher temperature and traditional tin-lead solder, which leads to higher temperatures for the reflow and wave soldering. This results in an adverse effect on the solder joint and electronic components. 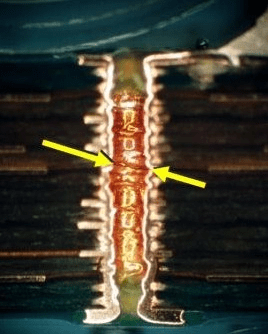 Barrel fatigue, which is the circumferential cracking of the copper plating that forms the plated through hole (PTH wall), is the most prevalent failure mode. 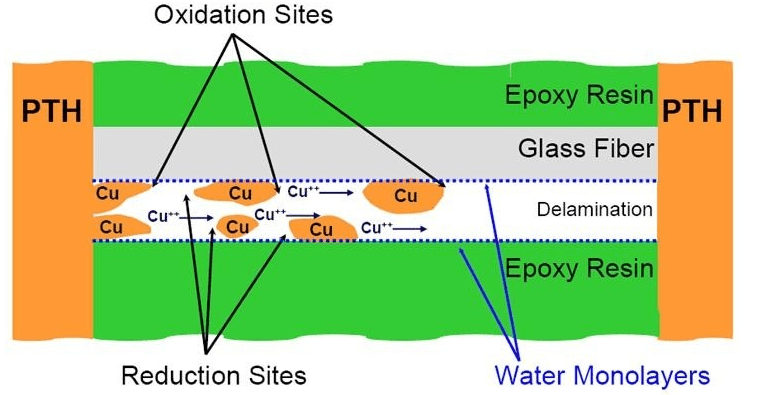 It occurs as a result of differential expansion between the copper plating and the out-of-plane coefficient of thermal expansion (CTE) of the printed board. The most important decision for the electronic assembly may be the surface furnish, which affects the process yield, the amount of rework necessary, field failure rate, the ability to test, the scrap rate and the cost. Conductive Anodic Filaments (CAF) or metallic electro-migration describes an electrochemical process that involves the transport of a metal across a nonmetallic medium under the influence of an applied electric field. The condition causes current leakage, intermittent electrical shorts and dielectric breakdown between conductors in PCBs. Anyways, PCB manufacturers must take the proper care to adhere to exact tolerances and specifications to avoid failures. This requires an effective root cause analysis to investigate and probe into components and systems, and make the necessary quality improvements.